Although archaeologists have found evidence of habitation dating back to the Bronze Age, the first documentary mention of Burghausen comes from 1025. Throughout the Middle Ages, the town’s main source of income derived from the salt trade from Hallein, Austria. When the salt trade changed in 1594, the town started a slow decline. Raitenhaslach monastery was first founded by the Cistercians in the mid-12th century. Fish farming and specialty crops were its main industry. 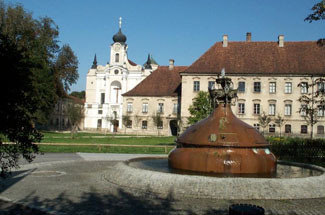 The Wittelsbach dukes from nearby Burghausen Castle influenced the course of the monastery’s history and were later buried here. The monastery always kept close ties with the Bavarian royal family. Over the centuries, the monastery suffered fires and tear downs, expansions and restorations. In 1803 the Bavarian government seized the monastery during the course of secularization and dismantled the library, chapel, and parts of the monastery walls. Its priceless artifacts were sold to wealthy citizens and the nobility, and its agricultural equipment to neighboring farmers. The monastery served over time as a school, brewery, restaurant, and private apartments. Depending on your point of view, the monastery’s church bells can either contribute to the atmosphere or drive you nuts. Burghausen is east of Munich on the Austrian border. From Munich, take A94 east, exit Burghausen, continue south on B20 towards Salzburg. Follow signs to Raitenhaslach, which is south of the town of Burghausen. With meadows on one side and the Salzach River on the other, this wonderfully friendly and welcoming monastery-inn offers some of Bavaria’s most unique accommodations. Its superb location just over the border from Austria makes it the perfect base from which to explore the area. With no formal reception area, come on into the restaurant to meet your hosts, who will show you upstairs (no elevator) to your room. The atmosphere throughout leans on the rustic side with antique furnishings here and there. Guest rooms, on the other hand, are quite modern with large, comfortable beds. Décor is stylish with an interesting flair. All of them are located above the restaurant, but the nature of the old construction makes for natural soundproofing. Bathrooms equipped with showers are modern as well. The restaurant, which specializes in Bavarian cuisine, features a charming, hand-painted, vaulted ceiling. If you can’t make it for a meal, then a romantic beer garden is a fun and friendly place to plan the next day’s adventures.